To be quite honest, a lot of people have no clue what they’re doing within Instagram. And to keep this in context, we are specifically talking about online fitness coaches. Opening an Instagram account and posting a bunch of shirtless selfies and you working out at the gym has no value, intention, purpose, and thus it’s not shareable content. We can say with confidence that after being actual practitioners within Instagram, spending money to test things, hiring coaches, attending conferences that specialize in Instagram…we know what we are doing. Now, that’s not to say we know it all, everyday we are being students, testing, and learning new things within Instagram. This is the exact reason we came out with this solo round! To help you really understand Instagram, be intentional, create valuable content, and to get online coaching clients. 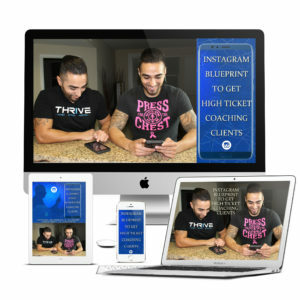 "Your Instagram Content Should be Short, Actionable, Goal Oriented, and Easy to Consume"
Are You an Online Fitness Coach and Want to Know How to Get More Coaching Clients Using Instagram?